Mushroom Thoran or Koon Thoran is a very delicious and highly nutritious food and a great side dish for rice. Koon/ Mushrooms are known as functional food; which means it has proven health benefits for the prevention, management or treatment of chronic diseases. These Fungi or Mushrooms are low in sodium, fat, calories and a highly beneficial food. It is fast becoming a popular item in every household menu these days because of its nutritional value. This Mushroom thoran is very healthy like Cheera Parippu Thoran,Vazhakoombu Cherupayar Thoran, Beans Thoran, Peechinga thoran, Sprouts Thoran, Vanpayar Thoran etc. Check for more Kerala style Vegetable Thoran recipes. More and more housewives in Kerala are starting mushroom farms, due to the popularity and demand. Care should be taken while washing Mushrooms as it absorbs a lot of water. Quick rinsing to remove the dirt and immediate cooking is recommended. Soaking in water should be avoided as it will raise the internal water content. 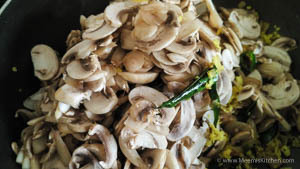 Only fresh mushrooms should be used for cooking; if the outer surface is slimy or moldy or dry and withered, don’t use them.Mushroom thoran is a popular dish in Kerala and is prepared in different ways. 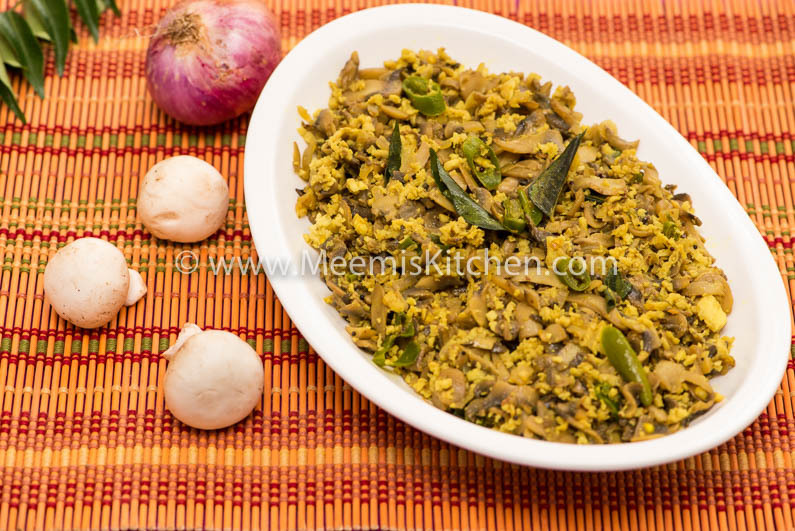 It is quite simple to make this Mushroom Thoran and tastes great with rice. Check out my other Mushroom recipes like Mushroom Pepper fry, Beef with mushroom and Kadai Mushroom also. I have used button mushrooms that are easily available; it can be made with oyster mushrooms as well. It is a comforting and fulfilling meal but light on the stomach. The earthy flavor of mushrooms are greatly refreshing and enjoyed by kids and adults alike. So try out this really simple recipe and let me know how it went. Enjoy!! Green chilies : 2 nos. Wash the mushrooms under running water rinsing properly and immediately drain. If there are stubborn dirt or stain, remove it with knife. Chop the mushrooms into thin slices (stems also can be used) and keep aside. 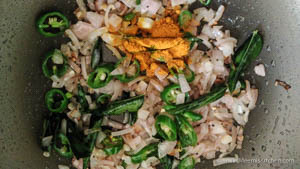 Chop the onions finely into squares, chop the green chilies into rounds and keep aside. Heat a pan and pour little oil. Pop the mustards and add curry leaves. Then add the chopped onion and chilies. Sauté for some time till it is limp. Add the turmeric powder and sauté. 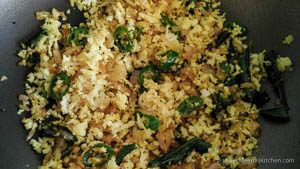 Then add the finely scraped coconut and fry on high flame, stirring continuously for some time, till the coconut is dry. Finally add the mushrooms and stir and cook on high flame. The mushrooms need very less cooking time so be careful not to lose any flavors by overcooking! Transfer to a serving plate and enjoy with hot rice. Rinse the mushroom under running water in a colander and immediately drain as it soaks up water. Professional cooks recommend wet wiping the mushrooms with a damp cloth to clean!! Use finely scraped coconut for better results. I have used a small amount of coconut oil in this recipe for added flavors. You may also try with sunflower oil or any other oil of your choice. Fry the coconut for some time till it is dry. Take care not to brown, but make it dry! Stir fry the mushrooms on high flame for 1 – 2 minutes only. Always use very little oil for better health. Mushrooms are low in sodium, fat and calories and highly nutritious making it a super functional food. Mushrooms are rich in fiber, potassium and vitamin C and contribute to cardiovascular health. Rich in Vitamin D, Selenium, antioxidants and folate it inhibits cancer cell growth and helps to detoxify cancer causing compounds. It has low calorie levels and is quite filling which makes it a good diet food. Hope you liked this easy and tasty Mushroom thoran. Please do put in your comments or share with your friends using the share buttons on the side; that would encourage me to post more home tried recipes. God Bless!! The button mushrooms have no health benefits and there is nothing in it as they are grown under light indoors and not good at all. Health benefits are for cremini and shitaki,cordesps and oyster mushrooms. You can prepare this mushroom thoran dish with these mushrooms too. Just thought of sharing this info. Thank you so much for this info. White Button mushrooms are more common and easily available. Fresh White Button Mushrooms are rich source of potassium and Zinc, but like you said Cremini, Oyster and shitake and other varieties are richer. You can prepare with all these. Thank you for sharing.